9 × = 72 Required Please enter the correct value. The price of silver has climbed 12% in 2016, and we found one major reason why silver prices will continue to rise this year. Worries about global economies, loss of confidence in central banks, and a slower pace of interest rate hikes from the U.S. Federal Reserve have all boosted silver prices in 2016. Spot silver rose 0.2% to $15.63 an ounce Friday morning. That pushed 2016's gains to more than 12% year to date. 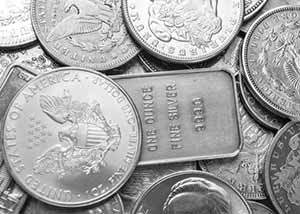 Silver prices hit their high for the year on March 7, when spot silver prices reached $15.66 an ounce. Increasing concerns over a liquidity crunch in China, soft corporate earnings, and global woes have driven investors to safe-haven assets like silver. Silver is an actual store of value and it holds up better than riskier assets when markets are rocky. Silver, like gold, is coveted as an insurance policy of sorts when markets fall. During the 2008 financial crisis, a time when investors were scrambling for safe havens, the silver price doubled. The Silver Institute recently said it believes the silver price should "find solid ground this year" and that the silver deficit will accelerate. The deficit has been building for more than a year. In the first 11 months of 2015, U.S. silver mine production dropped by roughly 8%, according to data from the U.S. Geological Survey. Dwindling supply should continue to drive silver prices higher. The Institute also sees higher industrial demand this year. Silver is used in solar panels, plastic production, jewelry, and coins. In addition, record demand out of India is expected. In the first week of March, the U.S. Mint sold one million bullion American Silver Eagles to its network of authorized distributors. Year-to-date sales, as of March 10, reached 12 million coins. That's 24.7% higher than the same time period in 2015. Last year's American Silver Eagles notched an all-time sales record of 47 million coins. At this year's pace, the Mint is on track to report another year of record silver sales. As the price of silver approaches the psychologically important $16 level, Money Morning Resource Investing Specialist Peter Krauth says a "host of fundamental and sentimental drivers are at work helping to push silver prices higher and odds are good they will remain supportive." The biggest catalyst for silver prices in 2016 is the spreading use of negative-interest-rate policies. The European Central Bank, Denmark, Japan, Sweden, and Switzerland all are experimenting with negative interest rates. The U.S. central bank worried investors last month when it said it has discussed the idea of a fed funds rate below zero. Money Morning Global Credit Strategist Michael E. Lewitt says the decision to turn to negative interest rates should not be taken lightly. "Negative-interest-rate policy (NIRP) is not merely some technical monetary policy tool; it is a tactic with profound political and moral consequences that must be exposed as a betrayal of the social compact between governments and citizens," Lewitt said. Negative interest rates hurt the ailing banking sector by cutting profits. And negative interest rates may be symptomatic of central banks reaching the limits of what they can do. Markets and investors have become increasingly concerned that central banks are out of policy moves and are worried about how policymakers would tackle another downturn. Minutes from the Fed's Jan. 26-27 meeting show policymakers appear increasingly reluctant to raise short-term interest rates at its next meeting. That reluctance may persist throughout 2016. The Fed's next gathering is March 15-16. According the CME's Fed Tracker Tool, there is virtually a zero chance of an interest rate hike at the meeting. That's bullish for silver prices in 2016. Coupled with mounting global financial distresses and prospects of more central banks turning to negative interest rates, the price of silver should continue to climb. BBC: Are Negative Interest Rates an Adventure in Wonderland?